Ever since he was in grade school, Reed Richards (Miles Teller) has been trying to build a transporter with his friend Ben Grimm (Jamie Bell). He is discovered at a science fair by Dr. Franklin Storm (Reg E. Cathy) and his daughter Sue (Kate Mara), who have been working on a similar device based on a design by Victor Von Doom (Toby Kebbell). Storm brings them together and combines their research to create a working interdimentional transporter. When the group uses the machine, an accident in the alternate dimension leaves them all with special powers. Now, the government wants to use the team's new-found powers for their own means. The "Not So Fantastic Bore," ladies and gents. You would think after the first two failed attempts at the Fantastic Four franchise, Fox would have learned from their mistakes. We're here to tell you, no, no they did not. 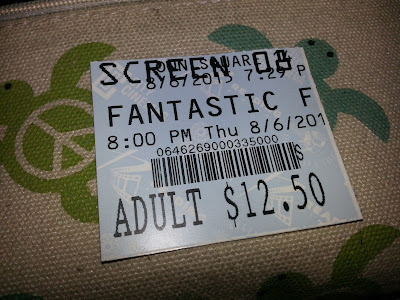 Director Josh Trank, previously known for the found footage superhero film "Chronicle," pilots this new incarnation of the "Fant4stic," driving characters with really interesting powers and plot points into the mundane mess that it is. Critics get it wrong all the time, this we know is true. Well folks, the critics aren't wrong about this film. Trank even recently tried to distance himself from the movie, blaming the studio for meddling with his "fantastic" film and turning it into this floptastic failure. This is all well and good, and it may very well be the case, but Trank is at least partially to blame for some it. Hell, he even got fired as the director of an upcoming Star Wars spinoff, and he can spin this news any ways he wants to, but we're sure in our hearts it had to do with how bad his vision for "Fant4stic" was and its subsequent suckage. It seems Fox is lost when it comes to what to do with this franchise. Their first theatrically released attempt was too light and campy, and this attempt flipped the switch the other way entirely, venturing into the too serious and dismally dark. Frankly? We prefer the former to this heaping pile of dung. What they don't realize is that it doesn't have to be one or the other. There is a balance, and this balance can and has been achieved, even this year in other cinematic works. Marvel, for example, found that balance with "Iron Man" and has successfully carried it now through 17 franchise films. Fox? They have yet to find their stride. There is little joy to be found when sitting in the theater for what feels like 3 solid hours of boredom and ambivalence. This film feels much longer than the 1 hour and 40 minutes we were actually there. There are so, so many problems with this film, starting with the cast. We look the actors in this film, high caliber up and coming actors including the likes of Miles Teller, Toby Kebbell, Jamie Bell, Kate Mara, and Michael B. Jordan. All of these people have been very good in other films or television shows, but here, nothing worked for any of them. Everything they said lacked passion and it felt as if they were all less than phoning it in. Their chemistry is nonexistent. None of them need to be together in the same room for anything, and for a lot of the movie, they aren't, so there's one thing they got right. The blame for this has to fall on Trank. As much as he attacks the studio itself for hacking his "baby" to bits, he is responsible for pulling a performance out of these very capable actors. 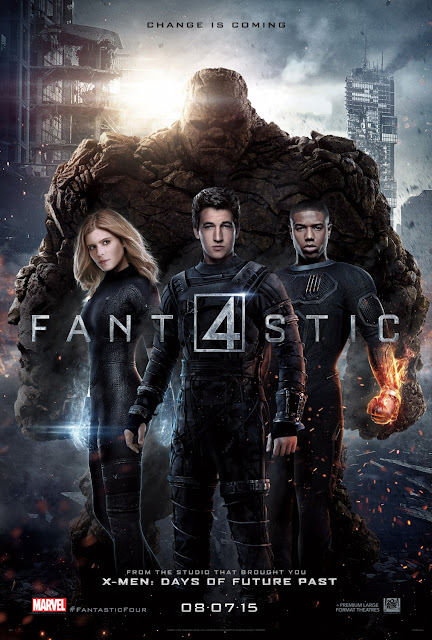 Trank and company decided to revisit the Fantastic Four's origin story in a slightly newer way, but the film spends far too much time on the pre-superheo powers aspect of the Fantastic Four. It fails to properly utilize the characters once they have acquired their powers, limiting them to mostly a laboratory environment with minimal in-field action sequences...that is, until the third act. Oh, the third act...if you didn't think this slogfest could have gotten any worse, hold onto your butts. The final grand villain in all of this is "Doom," or Victor Von Doom, played by Tony Kebbell, who received his powers in the same place as the Fantastic Four, some other worldly dimension filled with green energy ooze pools and a. lot. of. black. rock. The character's full power as Doom is absolutely underutilized and doesn't show up until the final 1/5th of the film. Kebbell's Doom seems to lack any real motivation for his actions other than being a little moody prick who is somehow smarter than Reed Richards, has a chip on his shoulder because Sue Storm clearly likes Reed Richards, and therefore, Doom shows his angst by flipping off people behind their backs and erasing math problems. ~*So EmO~* The remaining four members of this troupe haven't even been a full-fledged team up until this point. They are all disjointedly separated: 3 of them at a government research facility, and Reed Richards off in some foreign country staying off the grid and resorting to pre-1990's morphing graphics. Once they are together again, they must join forces to battle Doom in an uneventful CGI-bomb of a showdown. And when we say CGI-bomb, we mean it. We have seen video games with better, crisper, more clearly edited graphics. But, by the time this lacking glimmer of action appears on screen, we are already so bored with all the characters, the lackluster script, the poor pacing, the incoherent narrative and editing, the entire offensive incarnation, we just no longer care. We couldn't bolt from the theater fast enough. The stink of this movie is still on us and it is absolutely, truly, one of the worst movies of 2015, as well as one of the worst superhero movies ever crafted.